On 7 February 2014, Oriental Review posted “What about apologizing to Ukraine, Mrs. Nuland?” including a link to the recordings of two successive phone-conversations, uploaded to the Internet the day before, one (up through 04:10) with Obama’s Victoria Nuland telling the U.S. Ambassador in Ukraine whom to appoint (“Yats”) to run the Ukrainian Government after the coup (which would occur two weeks later) and including her subsequently famous line, “F–k the EU,” because the EU’s leaders wouldn’t like to be publicly associated with such boldly nazi (i.e., racist-fascist) people as Obama’s representative was now choosing to run that country; and the other (after 04:10 and spoken in German) between Helga Maria Schmid the EU’s Political Director (also titled the Deputy Director of the EU’s Diplomatic Corps), and Jan Tombinsky the EU’s Ambassador to Ukraine; and this portion of the tape being translated into English at that Oriental Review link, in the printed transcript they were providing of the entire tape. The rot, at the top, is so dangerous, it must stop. But who will even let the public know about it? 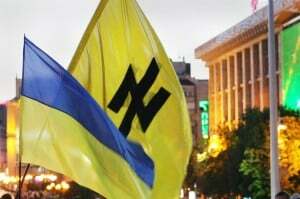 Nuland is the Obama regime official who was caught red-handed naming the members of the Ukrainian government Washington intends to impose on the Ukrainian people once the paid protesters have unseated the current elected and independent government. How can the American people vote intelligently if the aristocracy who own the “news” media won’t even let them know what’s really being done by the leaders they elect? How can democracy survive a deceived public? If congressional Democrats want to restore democracy to this country, they’ll have to introduce the first impeachment resolution against Barack Obama. If they don’t do that, then the entire political class in this country is complicit in the termination of American democracy — it’s not just the Republicans who are fascists.